Click here to view the Vista Patina color chart. Vista patinas are a two part patina combined in one solution. The base patina is a blend of chemicals that produce a beautiful green on bronze, brass, and copper, or an exquisite rust on iron & steel. Added to this base solution are different colored oxides which will blend with the first reaction to form a marbled patina. For example, using the vista black on bronze would produce a green and black patina and a rust and black patina on iron. 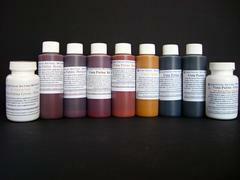 We carry seven unique vista colors which we are sure will add to your finish. Please select color and size below. There is one exception in the Vista Patina category, and that is the Vista Green. We now make carry two formulas for this color - one for non-ferrous metals (bronze, brass, and copper) and the other for ferrous metals (iron & steel). Please select the correct formula to suit your needs when ordering.